In India, tens of thousands of people make their living in the fishing industry. It’s a simple system, that has served them well for centuries. 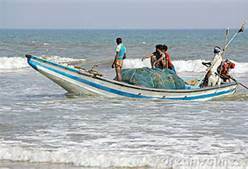 In the morning, thousands of fisherman take to the seas, some in boats little better than canoes. They fish by hand, and in the afternoon, bring their catch to the beaches. When they arrive, a multitude of fish buyers appear at the water’s edge. They barter and dicker with the fishermen until a satisfactory price is reached, and the fishermen go home for the day with their pay. As for the buyers, they move on to the markets.